The St. Clair Region Conservation Authority (SCRCA) has issued a flood warning across the region. The Wallaceburg Easter Egg Hunt has been postponed until Monday, April 22, 2019. 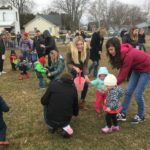 The annual Dresden Easter Egg Hunt has been postponed to Sunday, April 21. Environment Canada officials say significant rain is on tap to start the Easter Weekend. Internet Kent wishes you Happy Easter with Family and Friends. Mrs. Eleanor McNaughton, of Wallaceburg, passed away on Wednesday, April 10, 2019 at St.